Having Film & Furniture chose us as their charity partner is fantastic news for the Reuse Network. 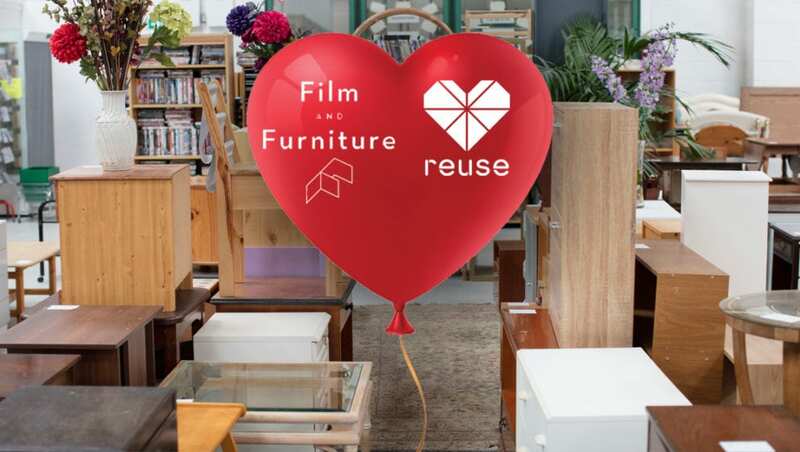 Film and Furniture declare their love for the Reuse Network and announce the launch of their charity partnership this valentine’s day. Valentine’s Day is about celebrating love and partnerships. Film and Furniture and UK charity the Reuse Network declare their common passion for furniture and homeware, and launch their partnership this Valentine’s Day, 14th February 2019. Through a series of fascinating features on the Film and Furniture website, a social media campaign, a talk by Film and Furniture founder and editor Paula Benson on the connection between furniture and identity at this year’s Reuse Network annual conference and their donation of a handsome “Batman Moon Bowl” (as seen in the film Batman v Superman: Dawn of Justice), this partnership promises to uncover the secrets of second-hand furniture and homeware. Film and Furniture, the definitive destination to discover and buy the furniture and homeware you spot in the movies has a passion for furniture and film set design. From the futuristic Djinn chair from 2001: A Space Odyssey, to the stunning heavyweight Italian glass whisky tumbler from Blade Runner and the eerie hexagonal patterned carpet in The Shining, Film and Furniture publish well-researched features which include contributions from some of Hollywood’s finest production designers and film set decorators, share behind-the-scenes insights on these fascinating pieces and show you were to buy these items for your own home. Whether a newly manufactured design classic, a preloved vintage piece or the actual ‘screen-used’ piece from the movie, these pieces convey compelling hidden narrative. For Film and Furniture’s avid worldwide audience, owning a recognisable piece from a film they’ve fallen in love with is the ultimate goal, but for many less fortunate, simply having their own mattress or a preloved chair would be the best Valentine’s present they might hope for. Although much is talked about food banks, the need to have a fridge to keep your food fresh or a cooker to heat it up is less discussed. Research has found that a carpet in the living room and bedrooms, and curtains or blinds at the windows are as essential items as beds, tables, chairs or a cooker; and this is certainly something Film and Furniture agrees with. Film and Furniture’s Benson felt that raising awareness of a furniture charity would complement their work and support a much-needed social and environmental cause. Having researched several charities, when Benson came across the Reuse Network it was love at first sight! This charity has a network of member organisations who provide preloved, affordable and essential household goods to those in need across the UK. Upcoming features on the Film and Furniture website and related social media campaigns will draw attention to the work of Reuse and bring to life Film and Furniture’s strapline “Furniture, lighting and decor with a story to tell”. Features will include the tale of the famous chair with two major onscreen appearances to it’s name (Big Brother and Charlie Brooker’s Big Brother spoof – Dead Set) which now has a second life helping people tell stories about their experience with mental health issues, and the chicken hut from The Muppets which is now a real-life chicken home in the garden of a film industry couple (to be published ahead of Global Recycling day on 18th March). Film and Furniture will be donating a ‘Batman Moon Bowl’ as seen in the film Batman v Superman: Dawn of Justice (in Bruce Wayne’s modernist lakeside house) to a Reuse member charity who provide formerly homeless people the opportunity to get off the streets and into a structured environment in which to live, work and rebuild their lives. Film and Furniture will be working with major film industry organisations and professionals to ensure that wherever possible, furniture used in films will be donated to Reuse member charities once filming has wrapped. Benson will also be delivering a talk on the connection between furniture and identity at the Reuse Network annual conference on 1st May. The Reuse Network believe that no one should be without a bed to sleep on, a cooker to cook on or a sofa to sit on. They work tirelessly with over 200 reuse member charities across the UK to make this vision a reality – providing support to help the poorest in our society build a brighter and better future for themselves. These charities help alleviate poverty, reduce waste and also help tackle climate change by diverting millions of household items from landfill, reducing carbon emissions and giving low-income households access to affordable goods. The Reuse Network itself helps all its members raise income, reduce dependence on grants, get better access to more household goods and create opportunities for those in need. “In Film and Furniture’s world the furniture is the star, so we’re delighted to support the Reuse network and raise awareness of their great work which unites people with preloved furniture and household goods. It not only helps those most in need make a home, it reduces waste and diverts millions of tons a year from landfill. We will be doing all we can to increase the profile of the Network as well as encouraging all our film industry contacts to donate furniture to member charities”. “Having Film & Furniture chose us as their charity partner is fantastic news for the Reuse Network. We are a small organisation who deliver big impacts thanks to our network of charities but don’t shout about it enough. Last year, the charity reuse sector helped 1.55 million households allowing estimated saving of £448 million. Reuse charities and social enterprises, reused 3.5 million furniture and electrical items last year supporting people access affordable household items in the UK. Accessing reused furniture and electrical goods has produced £448 million worth of savings for customers compared to buying items new. In addition to diverting 3.5 million items in the last year to households in need, the reuse sector supported over 52,700 people through volunteering, training and work placements and employed around 5,500 people part-time and full-time. The environment impact of reused furniture in 2017/18 has allowed 120,270 tonnes of household items to be diverted from landfill and saved 129,250 tonnes of CO2 emissions. Film and Furniture is the lovingly curated online resource discussing and directing you where to find the furniture, lighting and décor you spot in your favourite films. Film and Furniture was founded by Creative Director and furniture fanatic, Paula Benson. “As a child I used to while away the hours sketching my imaginary future house, together with all its décor and furniture. While I was doing so, my imagination was totally lost in the world I was creating – the look, the sensations and the conversations – like a film set. Whenever I watch a film I find myself losing the plot whilst studying the contents of the set”. Benson is also Partner of Form – the award-winning, London-based design and branding studio, who have rebranded Abbey Road Studios and Virgin V Festival as well as working with the likes of Virgin Galactic and Adidas. She lectures about design, branding, films and furniture around the world.